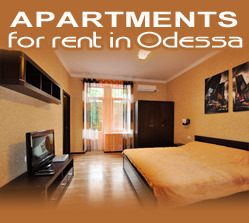 Rest with a comfort: daily rentals of apartments in Odessa. A person who arrived in Odessa on a business trip or on vacation, almost always faces with the problem of finding accommodation. A hotel accommodation has never been considered convenient. If usually the tourists visit coastal cities in the summer people go to Odessa all year round. Do not forget that our city is the largest port of Ukraine and one of the biggest centers of business and commercial activity. Therefore, in spite of the good development of hotel business the room rates are consistently very high. To rent a comfortable apartment daily will cost much cheaper than the hotel room. For less money you will get the maximum of comfort, convenience and confidentiality. Visitors who came to relax and had fun, it is very important to be able to rest and do not to pass several times a day by curious administrators by the counter. In the apartment, you can return at any time, quietly, no one will walk through the door or offer "room service" or annoy at the wrong time. The ability to prepare meals is also important. For people who prefer homemade food kitchens in the apartments rented daily, always equipped with all the necessary appliances and utensils. Another benefit of a daily rent is an opportunity to choose an accommodation in particular part of the city. The center of Odessa is for people who come to have fun and see the sights, for those who want to be at the center of the city life. For beach lovers the best option is to choose a place near the sea. Those who are trying to save some money can find affordable accommodation in residential areas. Our partner - daily apartments rent agency odessa.rent offers a large selection of 1 and 2 bedroom apartments in the heart of the city. The best in Odessa ration - a price and a quality, excellent service and a top location will guarantee you pleasant and unforgettable vacation in the city of sun, sea, humor and of course the most beautiful women.